Grey Jay, Canada Jay or Whiskey Jack. Bird Watching Grey Jays. Description - The Grey Jay, also known as the Canada Jay or Whiskey Jack, is grey above and whitish below; the forehead and throat are white and the nape and stripe through the eye is a dull black. Younger birds are a sooty-grey. They have a "whee-ah, chuck-chuck" call and scold, scream and whistle. 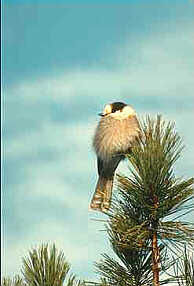 Distribution - The Grey Jay (Canada Jay - Whiskey Jack) is resident from Alaska east across Canada in coniferous forests. Also know as the Camp Robber, this playful rascal is a frequent visitor to campsites and summer cottages, and can be easily fed by hand or bird feedding station once you become acquainted. Biology - Being omnivorous, the Grey Jay feeds on meat, fruit, insects and various vegetable substances. They are attracted to campsites where they appropriate as much food as possible; with its saliva it glues meat, suet and/or hide into balls and hides it among pine needles. It lays 3-5 grey-green eggs in a solid bowl-like nest made of twigs and bark strips, lined with feathers and fur.